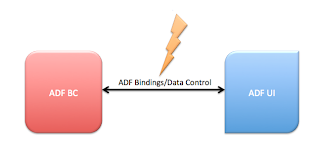 ADF Bindings and Data Control maps together ADF BC and ADF UI. Mapping by default is static, means ADF UI renders data collection from specific VO mapped during design time. 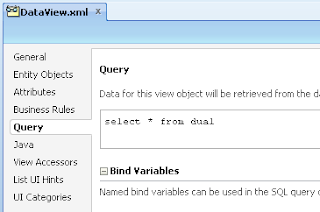 Sometime we have requirement to change data collection rendered on ADF UI during runtime. 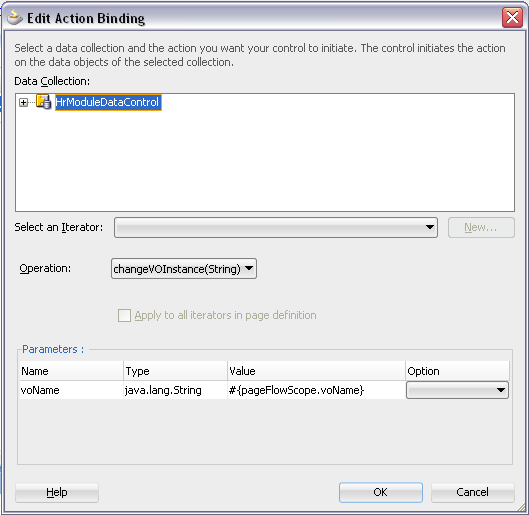 Dynamic UI can be implemented with dynamic VO's in combination with ADF Faces Dynamic Tags (Shay Shmeltzer's blog - ADF Faces Dynamic Tags - For a Form that Changes Dynamically). Dynamic VO's are created from SQL statements during runtime - such VO's will be readonly and hard to maintain. 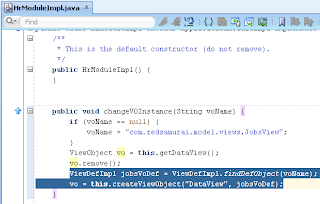 Moreover, its very hard to customize ADF Faces Dynamic Tags layout for custom UI requirements. We can set iterator binding in Page Definition dynamically, but this works only for Master-Detail VO instances - Dynamic Iterator Binding to Reuse View Link Relationship for Master-Detail. 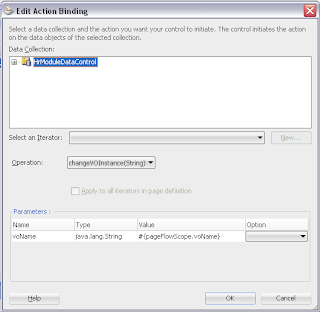 I will present in this blog post different technique how to implement dynamic editable ADF UI, assuming number of rendered attributes is not changing - but changing data collection. Sample application - DynamicVoApp.zip, implements such use case where we switch between different VO's retrieving data from different tables (we assume VO attribute names are the same, even underlying DB table column names are different). This is common scenario for business transactional systems, such systems tend to have large number of small tables with same columns and you need to minimize number of ADF UI to render such tables based on user role, etc. Of course we could build 100 different ADF UI screens for each of 100 tables - but we can be little smarter and build only 1 ADF UI screen to render all 100 different tables. Let's see how. 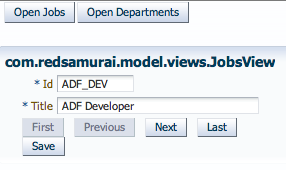 As you can see, just with one ADF screen we have implemented two use cases - Jobs and Departments editable UI's. You said dynamically iterator binding in Page Definition works only for Master-Detail VO instances. What did you mean? For sure, in such case, you have to have “real” VO instances in the AM. No, dynamic binding works only when switching between same VO different instances. Exactly this doesnt work, when you have different VOs :) i was testing this. If for you prefer another approach and it works in your case, i have blogged it as well. There is pointer in the post. 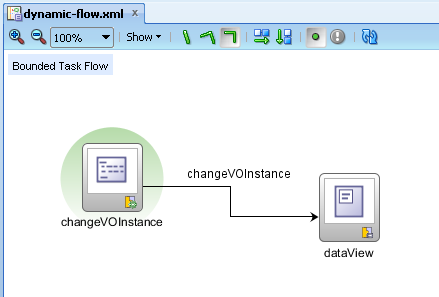 You can run into some problem with dynamic iterator binding when you show data in af:table. Because DefNode attribute in the PageDef's tree.nodeDefinition points to the particular VO's definition. And you really get empty table (in case of using another VO's instance). So, just leave the DefNode attribute empty or remove it at all. Yes, but leaving node binding empty, may cause proper key selection problem, this is more like workaround to me. While with proxy VO, you can change node definition programmatically always to be the same - my next blog post. 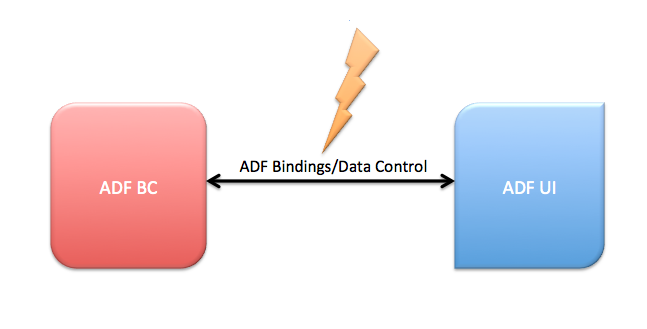 I recommend to control data structure from ADF BC itself, is easier to maintain in centralized way, instead of using EL. Additionally, table dynamic node binding is not working, not just because it points to specific vo definition, but because it doesnt accept expression language. It would work otherwise, simply it cant read page flow scope expression. Same is valid for other cases, for example if we have custom method pointing to the VO, etc. I also like dynamic iterator approach, but I think proxy VO gives more centralized control over what is rendered in UI. Can we do something similar for master-detail tables. I mean can we create a proxy for master and detail table and dynamically associate the VO instances. Great article. I was looking for a proxy pattern for VO's and I came across your excellent article. I'm trying this technique with slightly more complexity but I am getting an error. In my case, the 2 VO's are also linked other view objects (the same for both VO's) through view links. 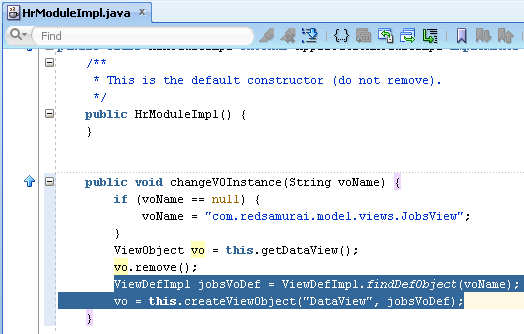 When I try to remove one of the VO, I'm getting a java exception saying that it cannot be removed, because it's still being referenced. Do you know how to resolve this? I'm thinking of removing the view links, but then I need to remove the other view objects first. But then I have to re-create them also. Not sure if this is possible. Thanks for your suggestion. BTW your example didn't work for JDeveloper 11.1.1.6.0. I redeveloped the example from scratch for this version of Jdeveloper. If you're interested I can send it to you. Please send sample app you are trying to test - I will take a look. Yes - this sample is implemented with ADF 11g R2, it can be downgraded to previous release. I was testing recently your proposed way of removing nodeDefinition for the table - it doesnt work properly. Well, it works for initial table rendering, but if you decide to switch to another VO, ADF 11g R2 complains about invalid node definitions after refresh. Thanks for the pointers here Andrejus. The table binding was a new learning experience for me. I'm glad you took the time to describe this in this posting. i tried to implement such nice idea but am experiencing a new problem has to do with passivation/activation of application module. this approach initialized VO dynamically remove dummy VO with actual VO. what kind of data that should be passivated/activated for such dynamic VOs. Hi Andrejus, nice post, thank you. 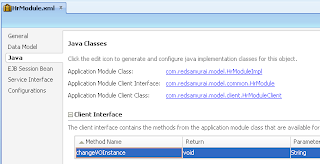 I have done an example with dynamic VO dummy and Dynamic Components, but when I execute the application with the AM pool disabled I have errors on Activation/Passivation.